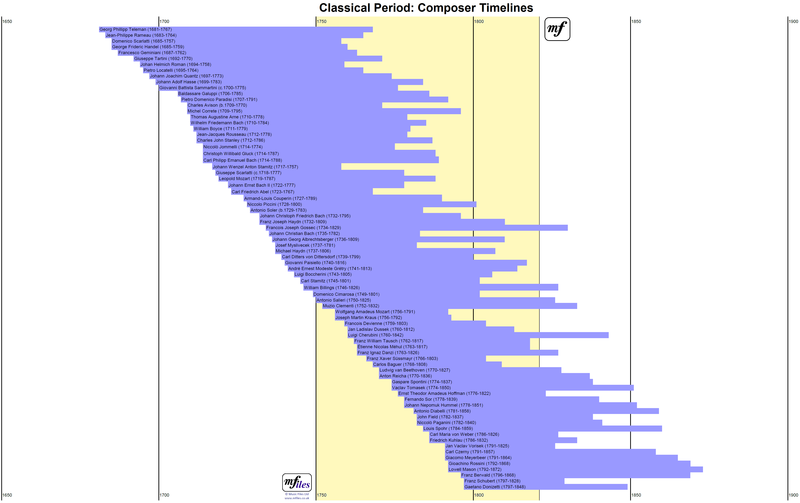 Musicologists divide the history of classical music into different eras or periods - see our description of the different Classical Music Periods. It is quite common to see historical events mapped out on a Timeline so that you can see the events in order. Such diagrams help you to see the "big picture", and with music you can plot the lifetimes of the famous composers. On such a timeline you can see which composers are contemporaries, and begin to get an appreciation for the number of composers creating music during different periods. Although these different periods are fairly well-defined, artistic trends don't always divide neatly into periods. Many composers lifetimes span more than one period, and certain composers were trend-setters who helped to bring about changes in the way music was created. So for example you will find Beethoven towards the end of the "Classical Period" but also at the beginning of the "Romantic Period" since he was instrumental in introducing new musical ideas which brought about the Romantic era. Below you will see a small version of each of the Timeline Diagrams scaled to fit on the web page. You won't be able to read the composers' names at this scale, but you will see immediately that the early diagrams are wide and short while later diagrams and tall and thin. Although this is no doubt in part due to the poor quality of historical records for the early periods, there is no doubt that the numbers of composers are steadily increasing. It looks as though the pace of musical development is accelerating, though this trend can be attributed firstly to the increasing accessibility of music (as more people became better educated and music moved from churches to royal courts to concert halls and beyond), a growth in the technology allowing music to be shared (the development of printing and better channels of communication), and a growing demand for music (from the increasing number of these channels, from publishers and from film and other media). 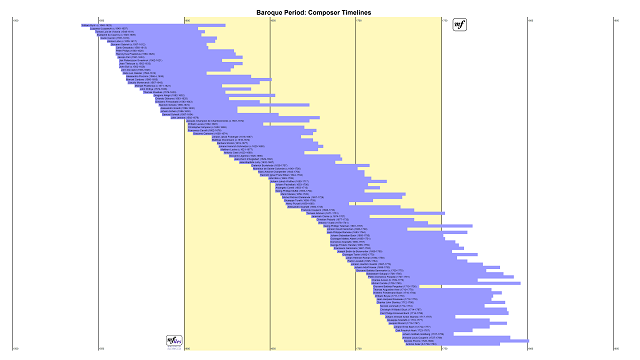 Here then are our composer timelines for these 6 musical periods Medieval, Renaissance, Baroque, Classical, Romantic and Modern periods. You can click on each diagram to show it enlarged in a separate window or tab, and most browsers will allow you to click again to see each chart full size allowing the composers' names and dates to be read. Further down this page you will find a complete listing of all the composers included on the diagrams. 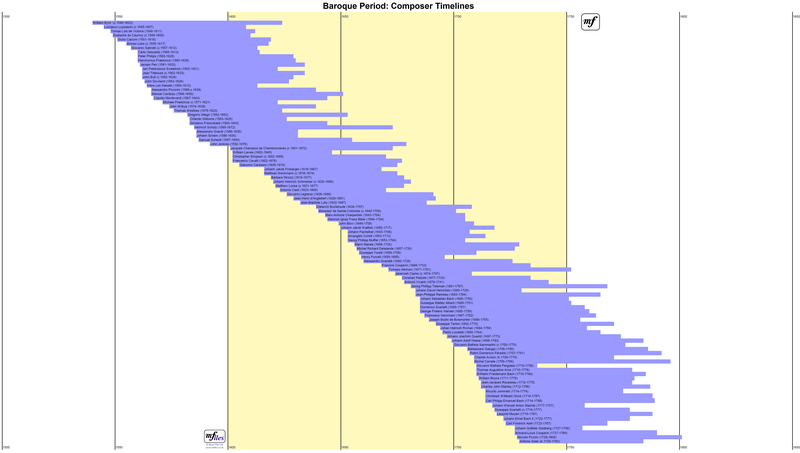 The above diagram is a composer timeline for the Medieval Period, approx. 800-1400. Click on the image to enlarge in a separate window. The above diagram is a composer timeline for the Renaissance Period, approx. 1400-1600. Click on the image to enlarge in a separate window. The above diagram is a composer timeline for the Baroque Period, approx. 1600-1750. Click on the image to enlarge in a separate window. 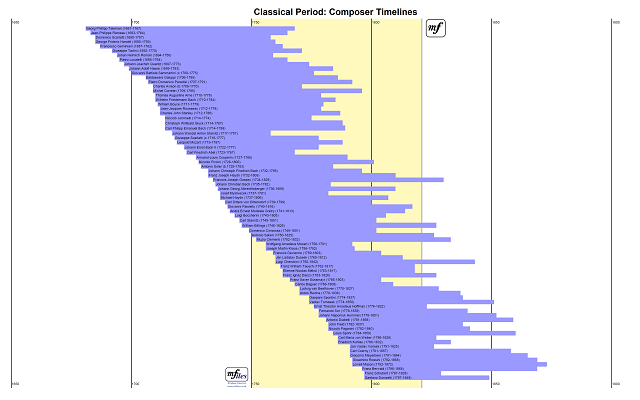 The above diagram is a composer timeline for the Classical Period, approx. 1750-1820. Click on the image to enlarge in a separate window. The above diagram is a composer timeline for the Romantic Period, approx. 1820-1910. Click on the image to enlarge in a separate window. The above diagram is a composer timeline for the Modern Period, approx. 1910 onwards. Click on the image to enlarge in a separate window. These diagrams have in part been generated from a database of composers. This is the full list of composers included in the digrams, together with references for further information or music examples. In later periods we have included a number of composers who are not usually associated with classical music. The details provided include the composers' dates of birth and death (as appropriate) although some dates are only known approximately. Composers listed on mfiles in some capacity have links through to their composer biographies and/or links to example music or articles which reference their music. 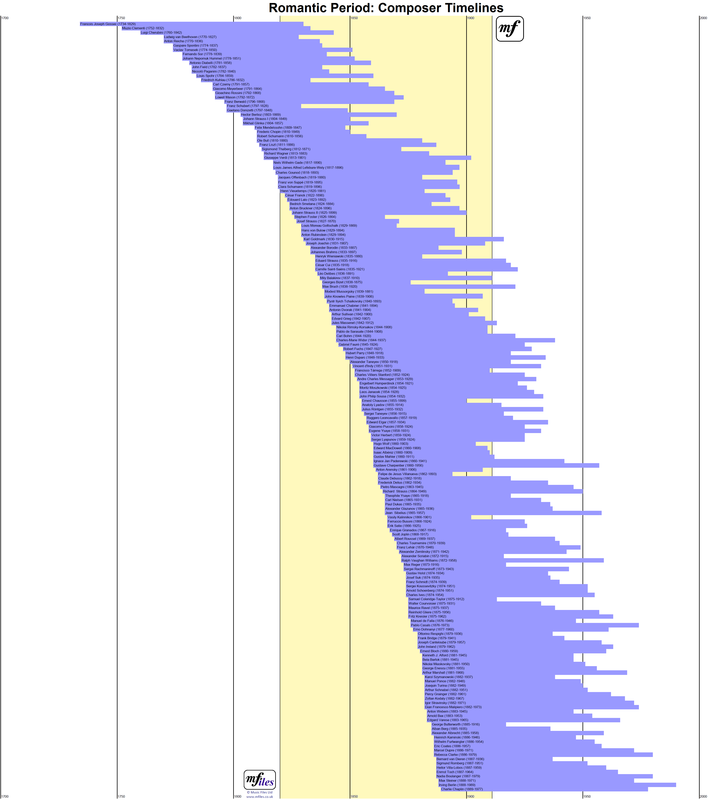 Some composers are listed on more than one period diagram. We've used a simple rule to decide which period or periods a composer belongs to, rather than analysing the composer's style. This rule-based determination is fairly accurate in most cases. The information about composers and their dates has been taken from a number of different references sources, including the Classical Composers Poster illustrated alongside and available to buy from www.Carissimi.com. Other sources include a number of reference books about classical composers and several online reference sources, particularly Wikipedia which has several huge lists of composers. Rather than attempting to be fully comprehensive I have aimed to included the main composers of each era. If you find any errors please let me know, and I will include a correction in the next release.